Someday, self-driving freight trucks may rule the highways in America. But today, an acute shortage of truck drivers across the United States is a concern for companies and economists. Increasing retail and industrial demand fueled by a strong economy and rising wages have boosted inventory levels at businesses, increasing transportation needs. But poor weather conditions coupled with full national employment have squeezed the supply of trucks and truckers, pushing up hauling rates and transportation costs. Demand for truck freight reached a record high in early 2018 before falling slightly in March, according to trucking industry data tracker DAT Solutions. Its load-to-truck ratio, a ratio measuring the number of loads that need transportation to available trucks, reached a record high of 10 in January, before falling to 7 in February. The ratio, which is an indicator of trucking cost, has been steadily increasing over the last 24 months. Such demand for transportation has driven up prices. The national average spot rate for freight trucking was $2.13 per mile in February, a 31 percent gain from $1.62 per mile during the same month a year ago. This increasing cost of transporting goods has hit the bottom lines of companies across the United States. Consumer food giant General Mills Inc. issued a full-year profit warning last week due to increasing costs associated with the shortage of truck drivers. In a March 21 conference call with Wall Street analysts, General Mills CEO Jeffrey Harmening said the company is “addressing higher freight costs in the near-term by qualifying more carriers and utilizing different modes of transportation.” Shares of General Mills fell almost 10 percent on March 21 following the comments. Fourth-quarter margins at Walmart Stores Inc., the world’s biggest retail chain, decreased 0.5 percent partly due to higher transportation costs, including trucking costs and higher gas prices, CFO Brett Biggs said on the company’s quarterly conference call Feb. 20. Confectionery maker The Hershey Company also noted that its adjusted gross margin fell by 1.8 percent due in part to higher shipping and transportation costs. Of course, trucking isn’t the only sector that is complaining about a labor shortage in today’s employment landscape. But more than others, such as cooks and construction workers, truck drivers are tough to recruit, given the profession’s demanding lifestyle, required experience and qualifications, and disparity between its short-term employment outlook (great) and long-term outlook (poor). The trucking industry is also unique because of its importance to the U.S. economy. Freight trucks are the lifeblood of America’s consumer economy—they represent 70.9 percent of the nation’s freight by tonnage shipped and 81.5 percent of the nation’s freight by cost spent, according to data from the American Trucking Association (ATA). Despite trucking’s significance to the national economy, there’s been shockingly little investment from technology and venture capital sources to propel innovation and drive competition. One of the few tech firms tackling this problem is Uber Technologies. The company behind ride-sharing last year launched Uber Freight, an app that matches truck drivers to those seeking transportation of freight. To incentivize truckers, Uber this month launched a program offering discounts on fuel, maintenance, tires, and purchases of trucks. Worst Still Yet to Come? The truck driver shortage doesn’t seem to be abating anytime soon. The biggest indicator of a longer-term trucker shortage is the demographics of those in the industry. 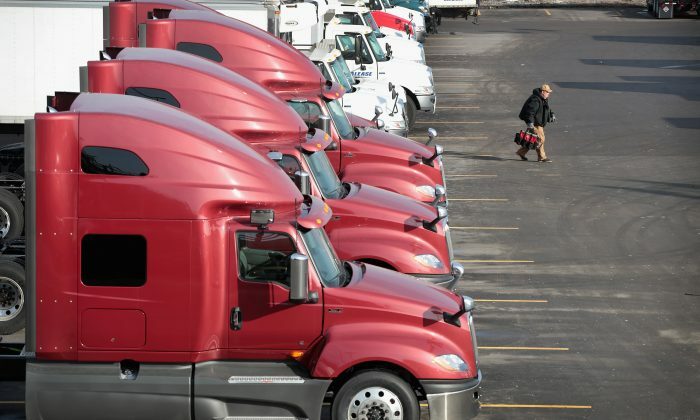 The U.S. Bureau of Labor Statistics (BLS) estimates the average age of commercial truck drivers is 55 years old, indicating that a high number of truck drivers will retire within the next 10 years. ATA, in its 2017 annual report, estimated that the industry will need to hire around 898,000 new drivers over the next decade to replenish the supply of retiring drivers. While truck drivers do not need a college degree, federal laws require drivers to be at least 21 years of age to hold an interstate commercial drivers license. This means an 18-year-old high school graduate who wishes to become a truck driver must wait for three years before obtaining a trucking license. The median pay for truck drivers was $41,340 per year as of 2016, according to the BLS. That is a good rate for a non-college graduate, but current buzz regarding the long-term impact of self-driving trucks could still discourage young people from pursuing the profession. In November 2017, Tesla Motors introduced a fully electric semi-truck with advanced semiautonomous driving capabilities. Other startups are also working on self-driving technologies, which seem to be the future of the industry. This outlook gives young prospective truckers little incentive to enroll in commercial driving classes and pursue a career in truck driving. While increasing wages in the short term could help alleviate the current demand for drivers, economists don’t believe that will be enough, especially if unemployment rates remain low and the threat of occupational obsolescence grows. “We expect labor shortages to persist in trucking for at least the next two years, as the economy remains strong, and as even in the best-case scenario, truck driver employment tends to lag rising wages,” UBS economist Seth Carpenter wrote in a February note, according to Business Insider.